Dang, did he just turn into a voodoo dude? Yup, he did. Well, it's not worth lamenting about it now. Really, the only thing to do is to embrace your little guy's newfound voodoo status. And we think the best place to start is by getting him a look that matches his disposition. 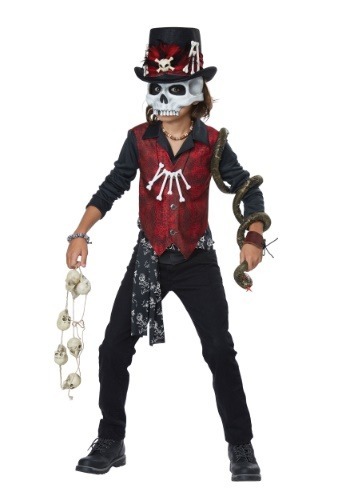 Like this boy's voodoo hex costume! Yeah, we're sure he's going to be doing all kind of crazy spells and whatnot now that he's dabbling in the dark arts. Maybe he'll finally get an after school job at the mall! Actually, we recommend kids only go out on Halloween while wearing this costume. It's a little too spooky for any other time of year. Can you imagine showing up at the Thanksgiving table wearing this thing? Grandma might not make it. That being said, if looking scary, creepy, spooky, and altogether sinister is the goal, than this costume takes the cake (or the beignet, perhaps?). This boys voodoo costume takes everything you know about Voodoo dudes and makes it better with TONS of details. There are bone accents everywhere, and the dark maroon and black color combos evoke a sense of dread and foreboding that you won't find out there on Boubon street with the rest of the crowds. No, this kind of costume comes from the deep alleyways of New Orleans, or even further out on the foggy bayou, where Voodoo whispers are still heard today. You definitely wouldn't find this guy setting up shop at your local mall, that's for sure!